KENNEDY SPACE CENTER, FL – Scarcely three weeks after the mesmerizing midnight launch and landing of a SpaceX Falcon 9 rocket that delivered over two tons of science and critical hardware to the space station for NASA, the innovative firm is set to repeat the back to back space feats – with a few big twists – during a post midnight launch this Sunday, Aug.14 of a Japanese telecom satellite. In less than 24 hours, a freshly built SpaceX Falcon 9 is set to transform night into day and launch the JCSAT-16 communications satellite from Space Launch Complex 40 on Cape Canaveral Air Force Station in Florida. And some nine minutes later, the 15 story Falcon 9 first stage is scheduled to make a pinpoint soft landing on a tiny, prepositioned drone ship at sea in the vast Atlantic Ocean. To date SpaceX has successfully soft landed 5 first stage boosters over the past eight months – two by land and three by sea. Nighttime liftoffs are always a viewing favorite among the general public – whether visiting from near or far. And this one is virtually certain to offer some spectacular summer fireworks since the weather looks rather promising – if all goes well. Sunday’s launch window opens at 1:26 a.m. EDT and extends two hours long for the 229 foot tall Falcon 9 rocket. The window closes at 3:26 a.m. EDT. The commercial mission involves lofting the JCSAT-16 Japanese communications satellite to a Geostationary Transfer Orbit (GTO) for SKY Perfect JSAT – a leading satellite operator in the Asia – Pacific region. JCSAT-16 will be positioned 22,300 miles (35,800 kilometers) above the equator. Sunday’s launch is the second this year for SKY Perfect JSAT. The JCSAT-14 satellite was already launched earlier this year on May 6. You can watch the launch live via a special live webcast from SpaceX. The weather currently looks very good. Air Force meteorologists are predicting an 80 percent chance of favorable weather conditions at launch time in the wee hours early Sunday morning. The primate concerns are for violations of the Cumulus Cloud and Think Cloud rules. 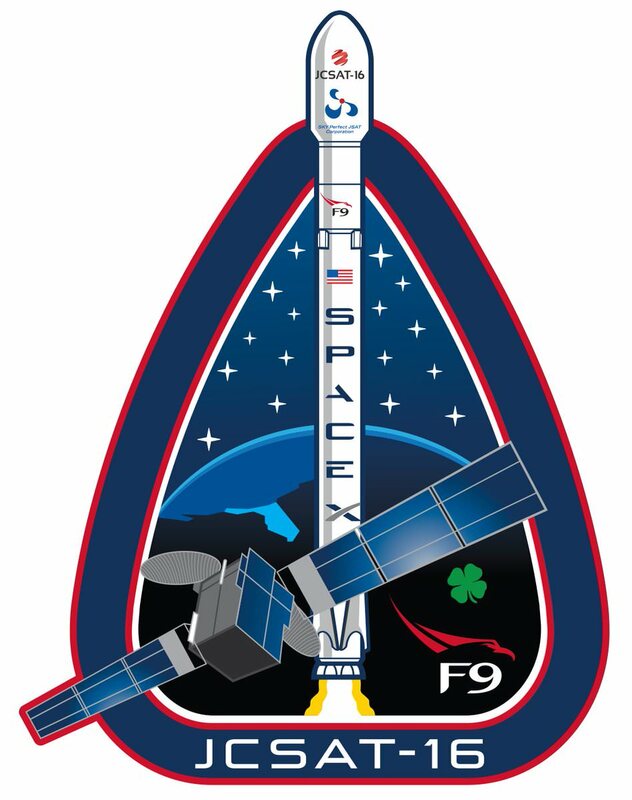 The U.S. Air Force’s 45th Space Wing will support SpaceX’s Falcon 9 launch of JCSAT-16. In cases of any delays for technical or weather issues, a backup launch opportunity exists 24 hours later on Monday morning with a 70 percent chance of favorable weather. The rocket has already been rolled out to the launch pad on the transporter and raised to its vertical position. The path to launch was cleared following the successful Aug. 10 hold down static fire test of the Falcon 9 first stage Merlin 1-D engines. SpaceX routinely performs the hot fire test to ensure the rocket is ready. Via a fleet of 15 satellites, Tokyo, Japan based SKY Perfect JSAT provides high quality satellite communications to its customers. The JCSAT-16 communications satellite was designed and manufactured by Space Systems/Loral for SKY Perfect JSAT Corporation. JCSAT-16 satellite will separate from the second stage and will be deployed about 32 minutes after liftoff from Cape Canaveral. 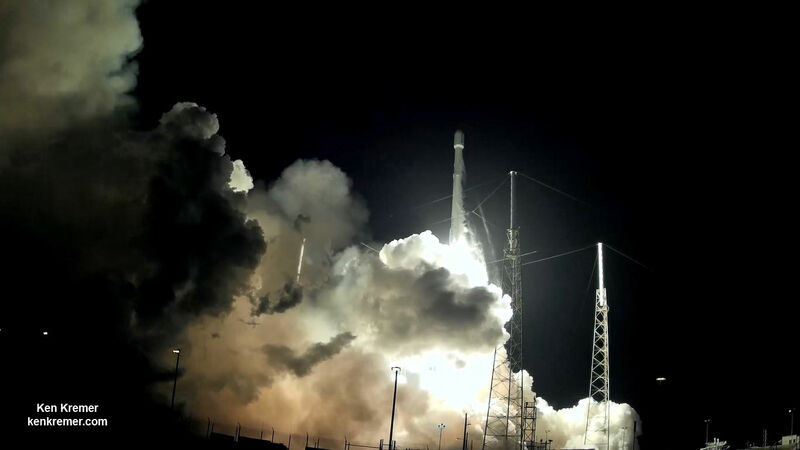 The staging events are usually broadcast live by SpaceX via stunning imagery from onboard video cameras. A secondary objective is to try and recover the first stage booster via a propulsive landing on an ocean-going platform. This booster is again equipped with 4 landing legs and 4 grid fins. Following stage separation, SpaceX will try to soft land the first stage on the “Of Course I Still Love You” drone ship positioned about 400 miles (650 km) off shore of Florida’s east coast in the Atlantic Ocean. But SpaceX officials say landings from GTO mission destinations are extremely challenging because the first stage will be subject to extreme velocities and re-entry heating. If all goes well with the supersonic retropropulsion landing on the barge, the booster will arrive back into Port Canaveral a few days later. 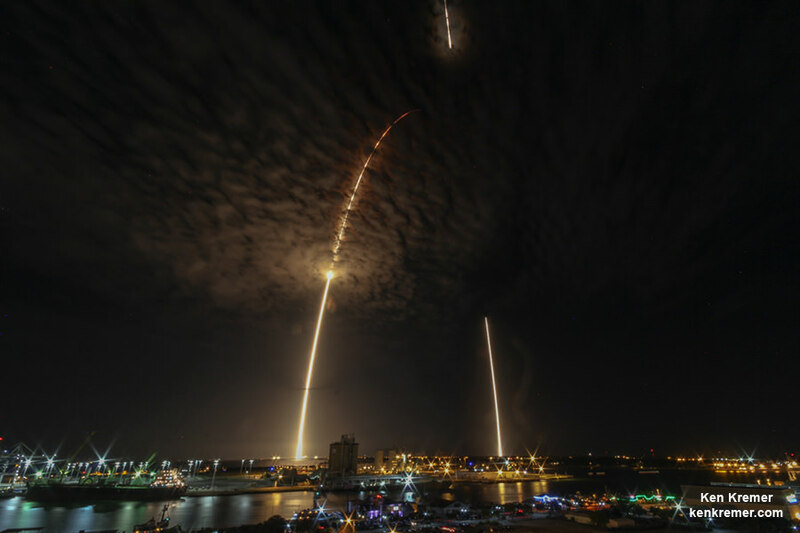 To date SpaceX has successfully recovered first stages three times in a row at sea this year on the an ocean going drone ship barge using the company’s OCISLY Autonomous Spaceport Drone Ship (ASDS) on April 8, May 6 and May 27. I don’t understand something , the launch is at 1:06 a.m. EDT , how it is supposed to be at night ? a.m. doesn’t mean ante meridien ,i.e before noon ? Next PostNext How Close Can Moons Orbit?